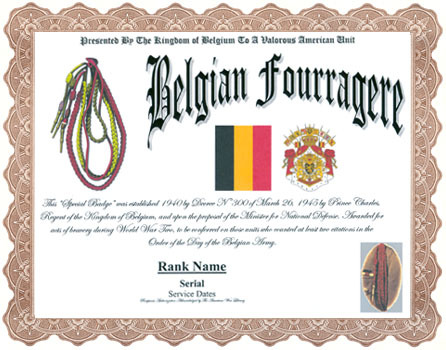 An unaltered photocopy of your DD-214, WD AGO, NAVPERS, NG or other military issued document clearly displaying your unit name that was awarded the Belgian Fourragere. If your awarded unit is not listed on your DD-214 you must provide a copy of your DD-214 -and- a copy of any military-issued document that displays your name and the name of the awarded unit. This 'Special Badge' was established 1940 by Decree N0300 of March 26, 1945 by Prince Charles, Regent of the Kingdom of Belgium, and upon the proposal of the Minister for National Defense. 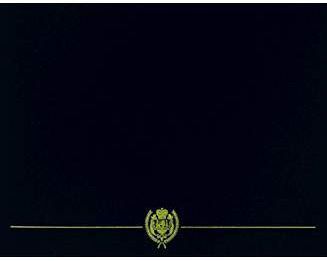 Awarded for acts of bravery during World War Two, to be conferred on those units who counted at least two citations in the Order of the Day of the Belgian Army.